LONDON – Sept. 16, 2014 – Northrop Grumman Corporation's (NYSE:NOC) U.K.-based air traffic management subsidiary, Northrop Grumman Park Air Systems, today announced the introduction of a new line-up of air traffic control (ATC) communication products called Sapphire. 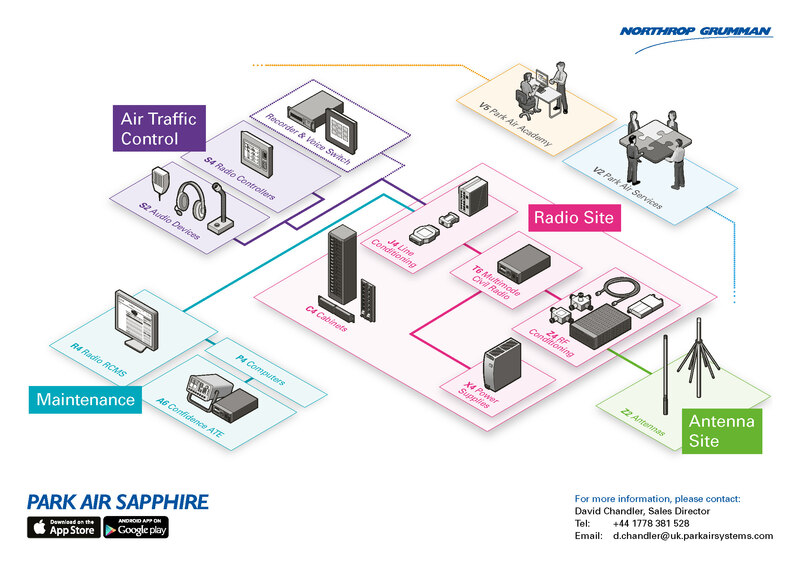 Sapphire is a solution-driven portfolio of products and services aimed at providing ATC communication systems with components designed to ensure ease of purchase, installation and maintenance. At the heart of the portfolio is the new generation of the world's most widely deployed ATC radio, the Park Air T6. The latest version of the T6 is a highly capable radio fully compliant with Internet Protocol version 6 (IPv6), and EUROCAE Interoperability Standards for VoIP ATM (ED-137). Ease of installation and maintenance are key factors in the deployment of an effective ATC communication system. For the first time, Sapphire introduces a new cabinet architecture which allows a tool-free installation of all system components through the design of an innovative mounting system for the new generation of radios, filters and ancillaries. The radio has industry-leading environmental features, including reduced power consumption and no hazardous materials in its construction. Half the size and weight of its predecessor, the all new T6 is the world's most compact ATC radio solution. Sapphire also includes the MARC Server, a highly configurable internet browser-based control and monitoring system to monitor all the Sapphire assets from desktops or tablets. The Sapphire equipment range is complemented by an expanded suite of support services that includes a new customer portal. This will enable customers to gain assistance, access technical information and track orders and repairs in real time. Sapphire also includes tailored training through the Park Air Academy based in a new purpose designed training centre at the company's facility near Peterborough, U.K. The Park Air Academy offers the latest in e-learning and practical courses centred on ATC communications theory, system design, implementation, maintenance and support. To showcase the Sapphire suite of products and services, the company has developed the Park Air Sapphire App for tablets. This can be downloaded for free use from iTunes and Google Play.